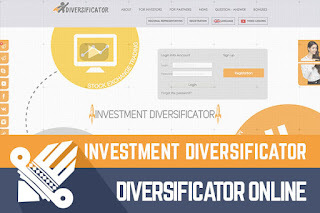 Today I’m reviewing a project called Diversificator Online, which is promising to do the diversification of investments. Program joined Standard listing on DavidNews.com on 27th of May and has been online already for 61 days in total. Now I have re-invested in the program $200, to keep an eye on the performance of it. Let’s take a closer look and find out more about the HYIP and its investment plans. The unusual layout of the home page is something that caught my attention right from the beginning. It has a layout, which is not that common among other HYIPs. Haven’t opened it yet? Basically, the top of the home page contains huge icons and one of them is embedded youtube video about the Diversificator Online. Looks interactive, but you can click only on the last one – the youtube video. All other icons are just there to fill the white area and provide some information. From these icons, I learned that diversification is being made across the stock exchange, portfolio investments and cryptocurrency mining and trading. Another thing I noticed is the video lessons, which are labeled under the name “free educational program – secrets of investing”. Probably it might be useful for those who can understand Russian. In total there are 10 lessons, but only one of them was in English. I believe the admin is decided to target mainly Russian-speaking audience, which is totally fine with me. However, I would suggest removing such videos from the English part of the website, to avoid any misunderstandings. There are proper names of each lesson in the list, but after clicking on any items there is a video in Russian. Enough about user experience and content, and let’s get to the most important thing for most of the review readers – to the investment plans. Diversificator Online is offering 4 different investment plans. Min deposit is varying from $10 and up to $501 in the last plan called VIP. Interest rates for the first three plans (Start, Business, and Investor) look very ordinary to me. However, the last plan is what makes me curious about the longevity of this HYIP. You ask why? It’s offering a very high return. Basically, keeping the deposit in it for 99 days would generate 10 times more than the deposit ($510 -> $5610). However, let’s look at a more realistic investment plan with $101 min deposit, which is called Business. A deposit of $200 would make $9 per business day. Please pay attention to the business day/calendar day and information about principal returns/included. This plan will not return the deposit and it’s included in the interest rate. Therefore, break-even point in this plan is reached only after 23 business days, which is almost 5 full weeks. Of course, if the HYIP will not end in the middle of it, an investor can earn $70 at the end of 30 business day cycle. Looks like this plan has already made a full cycle. If there is anyone among you who has anything to share about this plan or the HYIP, drop a message in the chat box. Investment plans: 1% for 20 calendar days, initial deposit returned at the end of the investment term. 4.5% daily for 30 business days, initial deposit included in the payment. 2% for 30 business days, initial deposit returned at the end of the investment term. Ignore 4th investment plan.